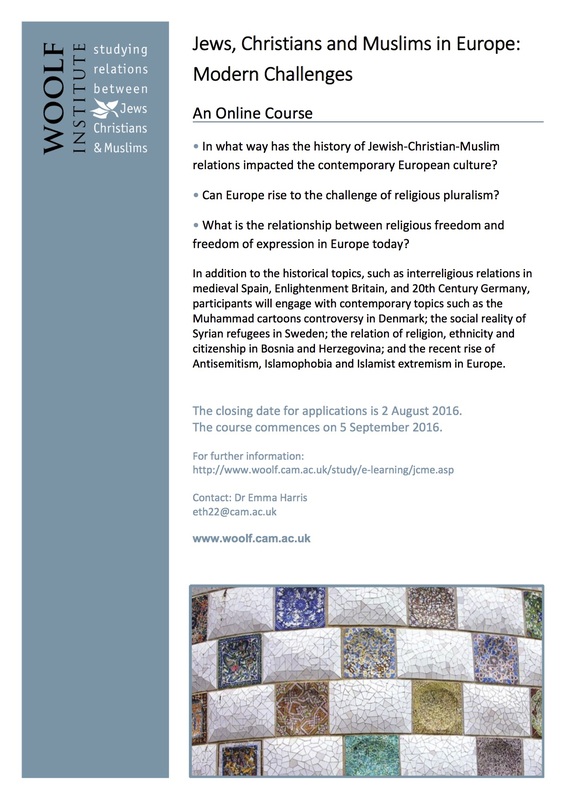 The Woolf Institute (Cambridge) is delighted to announce that applications are now being accepted for the e-learning course, Jews, Christians and Muslims in Europe: Modern Challenges. This timely e-learning course focuses on the relationships between Jews, Christians and Muslims in modern Europe. The course is multidisciplinary and examines historical trends, religious and cultural interaction, and issues of contemporary citizenship. The course will be led and co-taught by Dr Gorazd Andrejč , Dr Sami Everett, and Dr Esther-Miriam Wagner. For more information on the topics covered, the structure of the course, and the application details, please see here. The e-learning approach allows participants to study wherever and whenever they choose via the internet. Many participants from across Europe and around the world – Belgium, the Czech Republic, Denmark, Germany, Poland, the Netherlands, Switzerland, Turkey, the United Kingdom, as well as Australia, China, Kenya, Indonesia, Japan, New Zealand, and the United States – have already taken this course. To get a feel for the course from the students’ perspective, please find reflections on the course by two former students who completed the course here and here. The closing date for applications is 2 August 2016. The course commences, with Induction Week, on Monday 5 September 2016. The application form is available to download here. The course fee is £350. A limited number of bursaries are available. If you have any queries about the course, contact Dr Emma Harris, Academic Coordinator, at eth22@cam.ac.uk.